Convenient Shopping, Inviting Decor, Comfortable Surroundings. Kinkade’s Fine Clothing is conveniently located on the picturesque corner of Madison Drive and West Jackson Street in Olde Towne Ridgeland. Ample parking is available across Madison Street next to the railroad tracks as well as behind the building—feel free to come in through the back door! Feel free to give us a call ahead of your visit. Simply tell us what you’re looking for and we’ll prepare a special selection of items just for you. Click here to see our newest arrivals on Instagram. 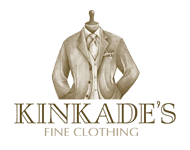 Click here for information on our custom tailoring services. Click here to keep track of Kinkade's on Facebook. Click here to give the gift of a shopping spree at Kinkade's.